As it sits, this car isn't a sleeper. Its creator had something else in mind. The unnecessarily bulged hood and white-raised-letter tires give a little too much away. Who knows where the exhaust comes out, but it is likely not aft of the differential and louder than WWII. This wagon is, instead, a hot rod of the classic type. 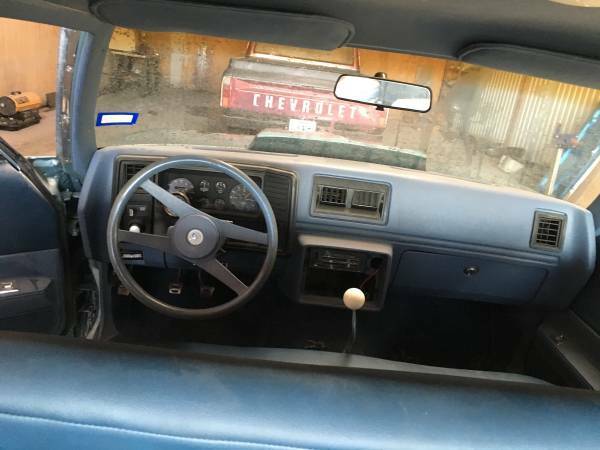 Find this 1979 Chevy Malibu Wagon for sale in Wichita Falls, TX for $14,000 via craigslist. Like its deuce coupe and shoe-box Chevy ancestors, this wagon is a familiar form raised to a higher state with the addition of modern technology. It makes no bones about its superior firepower, in this case a 5.3 liter lump and a 5-speed. Somebody liked the clean looks of this car and decided to make it way more fun to drive. 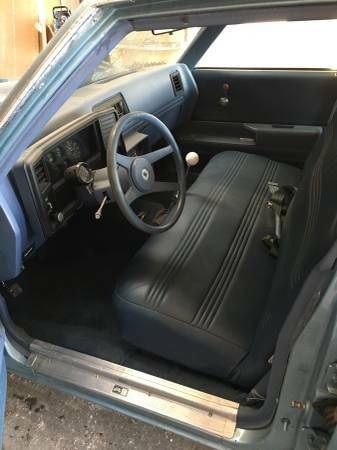 Station wagons and shifters are two awesome things that are not found together nearly enough. If you want this combo with a ground-pounding American V-8, you might just have to build it yourself. The creator of this vehicle was nice enough to install a contemporary Vortec so you can paint black rings in the church parking lot and wake up the neighbors with as little fuss as possible. If this car is as awesome as it looks, its new owner is going to have a fun summer of 2016. We at DT are happy in the knowledge that this wagon exists and is out there hooning it up somewhere. There's a pretty normal looking exhaust pipe sticking out behind the drivers side rear tire. It's too much money but I like the build, looks like a fun driver. I personally would have skipped the cowl hood but to each their own. Mom had one of these new. This shade of blue but in a two tone with a darker shade below the beltline. Being the kid, I was usually relegated to the back seat, and remember one frustration being that the back windows don't roll down on these. The power window switch you see in the back doors only opened those little vent windows a crack. Mom's had a little 305 with a 4 barrel that my Father was forever cursing at while fighting predetonation issues. All probably due to the emission equipment that choked these so badly back then. One night, while he was tinkering with it, we took it for a quick ride with the air cleaner off. It was the first time I got to hear the wonderful sound that is produced when the secondaries of a 4 barrel carb open under full throttle. I've always wanted to build a nice touring rod from one of these, but this one is far from being at the 14k price point. All the trim is missing around the back windows, and there are rust stains apparent along the edges of those dreaded little rear vent windows making me wonder what this wagon looked like prior to paint. And what is up with that front bumper? The bumpers on these rusted terribly making the tail lights nearly impossible to get out for a bulb replacement, until the bumpers eventually removed themselves from the car all together. There are rust stains around the tail lights and the black paint would make me really take a close look underneath this car prior to purchase. 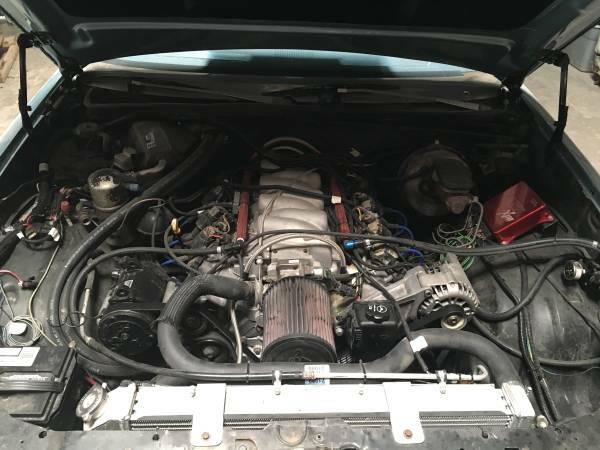 The a/c compressor and components are still on the engine (heavy) yet they aren't connected to one another, and why does anyone do an engine swap yet not take the time to clean up the compartment while it is empty? If the engine is sorted and running well, and the underbelly is clean, this wagon would have my attention at 5k. Lot's or work to be done, but lot's of potential too. 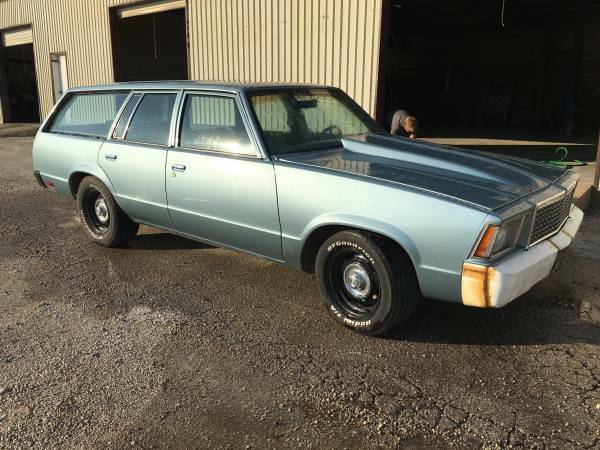 I've never viewed this site until now, but while browsing google images I found these photos and I'm happy to report this Malibu wagon has a new home in SE Oklahoma and is alive and well. The kids and I took it for a cruise today and after dropping them off, out for a spirited drive and laying down some fresh stripes. Car is a pleasure to drive. Totally awesome. Nice to meet you, and hope to see you become a regular. Post a video!